On Wednesday, Oct. 24, Hagerty Lounge was electrified by rare fire. One chord of anticipation ran from the back of the room to the first several rows occupied by students from the English Department and the MFA and Creative Writing program, and beyond, all of it fixed on a single point: the microphone standing before the fireplace. 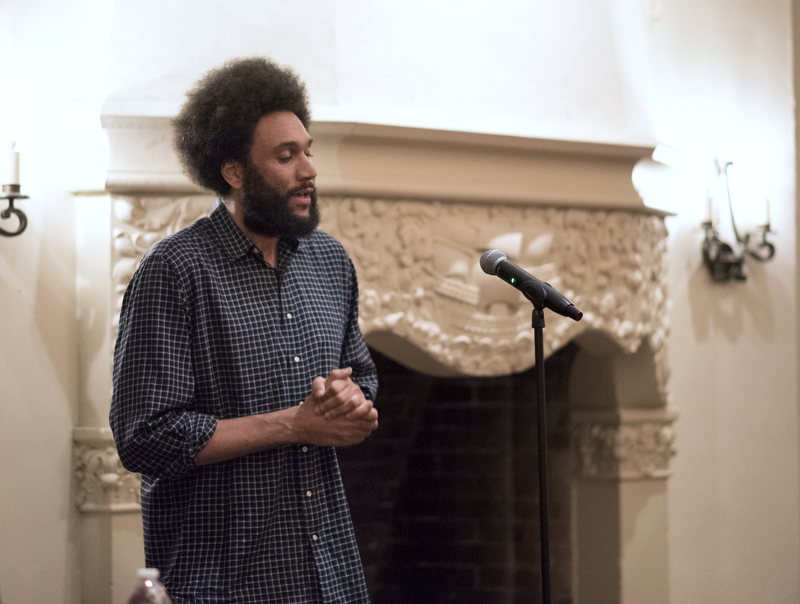 The mic was soon overtaken by Tongo Eisen-Martin—SMC’s MFA in Creative Writing’s Distinguished Visiting Writer in Poetry this term—presented this evening by the program’s Creative Writing Reading Series. As an author, educator, and activist, Eisen-Martin is a force of nature. A native of San Francisco and lifelong community advocate and independent teaching artist, Eisen-Martin has long been ubiquitous in the Bay Area and synonymous with the region’s vibrant literary arts communities. His work’s impact and power have been felt across the nation. “Art is between you and your craft,” Eisen-Martin instructed the student poets in the room. In any given week, Eisen-Martin may be found anywhere from community centers, prisons, and bookstores, giving talks and leading seminars on Hegelian dialectic and activist poetics; to museums and arts centers such as Marin’s Headlands Center for the Arts, collaborating on commissioned works with fellow authors and sculptural artists. In this past week alone, his poems “The Suburbs Are Finally Offended,” “Front Man,” and “Three Parties Later, Five Minutes Have Passed” have been published in the November issue of Harper’s Magazine, and this past weekend, he accepted the Before Columbus Foundation’s American Book Award for his second collection, Heaven Is All Goodbyes. It is this unique interstellar constellation of professional author, teaching artist, and engaged social activist that makes his run as the Distinguished Visiting Writer in Poetry this term such a potent and generative uniting of forces. As a wordsmith on the level of the line—a principle organizing unit driving many poetic forms—Eisen-Martin evokes a mental experience that unites the reader’s imagination and the perceptions of the many speaking voices throughout his poems. “Reality is a play on both perception and projection,” he noted. As a performer, Eisen-Martin transforms every room he occupies into a gateway through which the many voices and forces that move throughout humanity may speak, often concentrating on and located in urban space and in conversant relation to systemic and structural disenfranchisement. Sitting in Hagerty, the spellbound attention of the audience was palpable in the air, each listener entirely taken up into the lives of the poems. The feeling of collective involvement incited by Eisen-Martin’s reading continued into his conversation with Olivia Filippi Chair in Poetry Brenda Hillman, and the Q&A with students. Discussing and comparing the aesthetic potentials of the well-crafted poetic line, interrogating questions of perception and reality, and iterating the importance of an integrated artistic, pedagogical, and civic life, the activist-poet-educators displayed a strong concord and affinity; the two great minds seemed in conversation not only with one another but with every student, faculty member, staff person, and alum in the room.